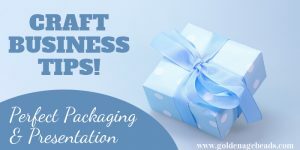 Developing a promotional strategy for your craft business is vital if you want it to be successful. At the same time, keeping your overheads down is important if you want to return a good profit and let’s face it, advertising can be expensive! Luckily, there some ways you can spread the word about your business without breaking the bank. 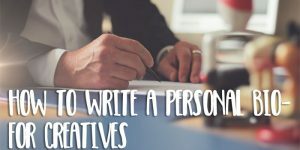 In this post, we’ve put together some promotional methods that you can use that won’t need much of your money – but may need quite a bit of your time to carry out. It doesn’t cost much money at all to start a blog to help you promote your products – just a few dollars per month to pay for hosting services if you’d like your own domain name (or free if you don’t mind having a WordPress or Blogger hosted site). 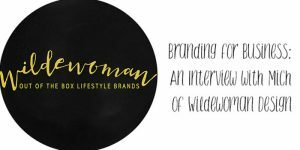 Having an online presence in this day and age is crucial and the good thing about having your own blog is that you can really build a loyal following by keeping your visitors engaged with stories about your latest products. If you have an Etsy shop, you can link straight to it from your blog to provide another direct route to your store. You can also set up a blog subscriber list, which will give you a way to connect directly with the people that love your products, whenever you want to keep them updated! To find out more about starting your own blog, take a look at this article. Social networking sites like Facebook, Pinterest and Instagram are the perfect platforms for spreading the word about your products for free. Each one has the potential for helping your posts go “viral” which means getting your products in front of a great number of people interested in your work. You can set up your own dedicated Facebook page for your craft business within 10 minutes and then invite your friends and followers to “like” it. They’ll then see posts from your page showing up in their own Facebook feeds. A good way to grow your following and drum up interest about your products is to run a competition – Facebook works really well for this kind of activity. You can run a simple competition on your page’s timeline and encourage people to enter and share it. The more people that interact with your post, the greater your post reach will be. You could post photos on Facebook of your work at different stages and then final products when they are ready, along with details of how to purchase them. This is a very powerful visual bookmarking tool and it’s popular among crafters and Etsy shop owners. 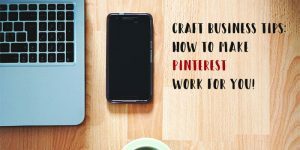 Once you have a Pinterest account, you can begin uploading product images from your Etsy shop or blog (along with your shop or blog URL). The great thing about Pinterest is that an image you pinned there a year ago can still be picked up and repinned many times now and in the future. So if you have evergreen products that you sell all year round, Pinterest can be a great vehicle to continually promote them. You can also promote your seasonal products at different times of the year too of course. Pinterest is basically a big search engine. You can type in what you’re looking for in the search bar at the top and thousands of results will show up in your feed. You can help your products appear in your follower’s feeds by paying attention to the pin descriptions and using keywords relating to your niche. You can also join group boards and pin your product images to those boards as well as your own. The benefit of doing this is that you’ll be getting your products in front of an extended audience as well as your own followers! Tip! Vertical images work best on Pinterest – research shows that these are more likely to get repinned as opposed to horizontal images. This platform is fast becoming the one to watch. Again, this social network is based on powerful images and you can use it to drive traffic to your craft shop and increase product sales. Because Instagram is heavily focused on images or videos, it really is a must for creative business owners! You could miss out on many customers if you’re not on Instagram. You can make the most of Instagram by filling out your profile completely, using relevant hashtags that are related to your craft and posting interesting content regularly. This article is helpful for those looking to get started on this platform – 5 ways to build your creative business on Instagram. Another good way to promote your business and products (providing you have a camera or camera phone) is to create videos for YouTube. You can create a showcase of your own products and provide a link to your online store in the video description. A great way to get YouTube subscribers though is to create video tutorials. These can do wonders help people to recognise you and your work and providing you do showcase your products as well, you should also be able to increase your sales. You can download video editing software such as Windows Movie Maker (free with Windows Essentials) to professionally edit your videos. You can promote your craft business for free by asking magazines to feature you. This can lead to a great increase in traffic to your online store or blog and in turn, quite possibly a big increase in product sales too. Many magazine companies are looking out for fresh new content and information to inspire their readers. Craft magazines are the obvious choice to approach first of all. You could offer to put together a tutorial based on your expertise and ask for a mention of your shop to be included at the end of the article. If you have a story to tell relating to your crafts, then other magazines may be interested to feature you too! If you want to promote your craft business locally, you could create your own flyers and hand them out in your local community. You may also be able to take advantage of free business card offers to help with spreading the word about your business locally. Suppliers like Vistaprint often have deals running where you can order a batch of business cards for free (in the hope that you’ll order more). 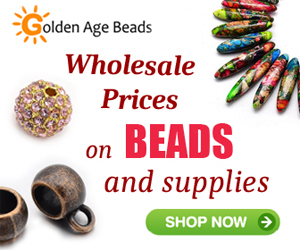 Joining online craft forums is useful for telling people about your products for free and connecting with like-minded people. You could post examples of your latest work along with a link of where it can be purchased. Always check forum rules before posting links to your store though. Some forums may request that shop links be added in member bios only rather than in individual post threads. To get started, check out Craft Forum and Craftster! 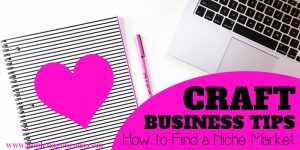 There are a number of craft directories online where you can list your craft business either for free or at very low cost. It’s definitely worth adding your business to as many directories as possible along with a link to your online store or website. Doing so will help you generate backlinks to your shop or blog which is useful when it comes to search engine optimization. Directories will also help expose your business to more people. When it comes to marketing your business, it can be worth spending some money on targeted advertising now and then. However, if you’re planning to do this, be sure to analyze all the opportunities available to you to see which options could give you the best results. With that said, it makes sense to try as many free avenues as possible too, especially if you do need to keep your overheads to a minimum. 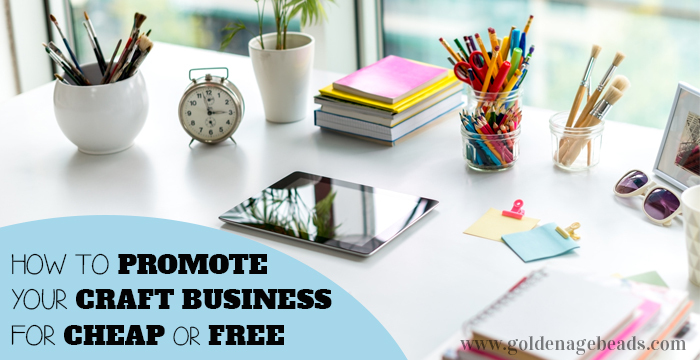 We hope that this article has given you some ideas for promoting your craft business at low cost or even free. 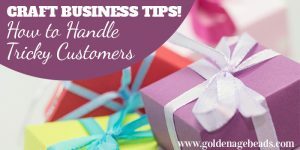 Why not check out our Business Tips section for more articles like this?